Some things you never forget – the first time you laid eyes on each other, the butterflies in your stomach on your first date, and that first kiss. Whether you’re spending your very first Valentine’s Day together or you’ve celebrated it many times before, we raise our glasses to you. And we’re here to help you create more lasting memories together. To create the perfect touch for one special evening as well as everyday use, take a look at our gorgeous range of electric candles and candle holders. Our safe flameless candles will fill every room with a soft, romantic glow just like real candles but without the hassle. For the more practical gift your other half might appreciate one of our herb planter sets. There’s nothing like having fresh herbs at hand, especially ones you have grown yourself. They come ready with seeds and compost included so you can start your own mini herb garden the day it arrives. We wish you a great day, and many special memories to come! PS: Why not also browse our range of over 1000 planters and our ready-to-plant flowers and create your own gift set or browse our extensive range of water features? If you want to break it, please use safety goggles! Over the last few weeks on EastEnders, Masood has been building our 2 tier classical stone fountain in his front garden for Zainab. The fountain really looked great in the front garden of Albert Square, complementing the Victorian terrace behind. It’s a lovely piece and would really only take an hour or so to assemble, unlike his attempts to build it in several days. Unfortunately, the screenwriters used the fountain as a symbol of their relationship and, when the plot drove them apart, Masood attacked it with a hammer. As you can imagine, we’re as heart-broken as he is. We’ve tried to contact Masood to help him out with some replacement pieces, but our letters to Albert Square keep getting returned as “unknown address”. Given the snow and rain we are all suffering from, one of the best things you can do in the garden in February is stay off the soil until it has dried off somewhat. I am always amazed at the amount of tidying up needed when the snow goes, it’s as though the garden has all kinds of secrets slowly revealed by the receding white. Once it all looked pristine and smart, and then nature sets in with her chaos and leaves the garden a scruffy mess. There are many advantages to encouraging wildlife to thrive in your garden. Not only is it fascinating to witness nature up close (especially if you have children), but encouraging certain types of creatures to take up residence in your garden will act as a natural deterrent for many common pests. Birds make a valuable addition to any garden as they will eat most insects, with certain kinds of birds mercifully enjoying snacking on slugs and snails. Pest-eating birds include: robins, magpies, wrens, song thrushes, blackbirds and fieldfares. While insects are amongst the pests you want to eradicate, there are some insects that are actually useful to have in your garden. Ladybirds, lacewings, parasitic species of wasps, hoverflies and beetles are among the good kinds of insects who like to eat other pests common to UK gardens. 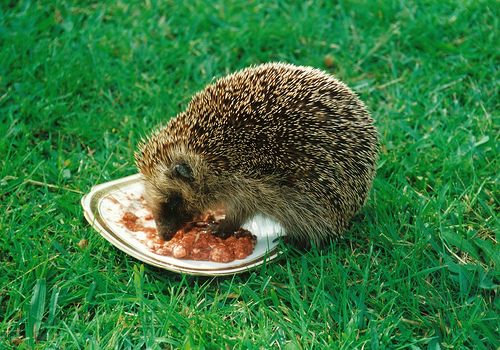 Other creatures to encourage are hedgehogs, frogs, toads, bats and newts, all of which enjoy eating the pests you hate as part of their daily diet. Garden pond – Ponds are loved by many creatures, such as frogs, dragonflies and newts, which all need water to breed; birds which use them to drink and bathe, and water boatmen, which live on the bottom of ponds and consume algae and plant debris. Compost heap – A compost heap provides a place for hedgehogs to hibernate and for slowworms to breed; it will also supply valuable compost that will naturally fertilise your garden’s soil. Long grass and nettles – Long grassy areas will attract insects, provide shelter for animals, and food for predators. Thick hedge – A hedge gives nesting areas and cover for birds, while berries provide food during the winter. Logs – Logs provide an excellent hiding place for all sorts of amphibians, frogs and ground beetles. Providing food doesn’t have to just mean hanging a bird feeder or throwing out some nuts for the squirrels. In the autumn and winter months, berries and seeds are in plentiful supply, providing food for birds and many other insects. The garden plant Pyracantha provides berries as well as shelter for birds and support for insects; it can also be trained against a wall. Summer provides you with many options for food. Plants that are rich in nectar can encourage predators such as wasps and hoverflies. Fennel, Dill and Aster plants provide food for many insects, as well as flowers such as Candytuft, Aubrieta and Wallflower, and shrubs such as Viburnum and Buddleia. You should try and include at least one nectar-rich plant for bumblebees. For a wildlife friendly garden, shelter is vital to protect the creatures from predators, give a place to nest, and somewhere to hibernate. Trees and plants such as Evergreen provide all-year round cover. 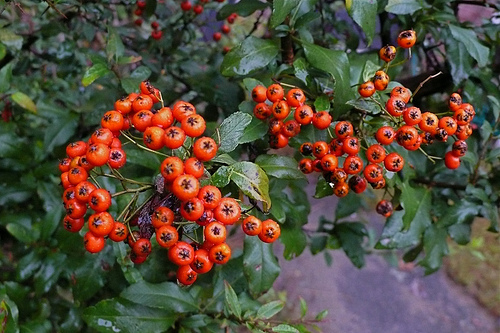 Rose, Pyracantha and Mahonia shrubs are an excellent choice for nesting and provide berries and hips to eat. Climbers provide much needed protection, camouflage and nesting spots for birds. Bats and hedgehogs can be lured into the garden with a compost heap or piles of leaves, though if you’ve got the cash to spend you can buy a special box shaped house where hedgehogs can hibernate and bats can sleep. This is a guest post written by Amy Fowler for Garden Topsoil Direct; specialists in compost delivery across the UK. Find out more on their Facebook page or find out more about Amy on Twitter.